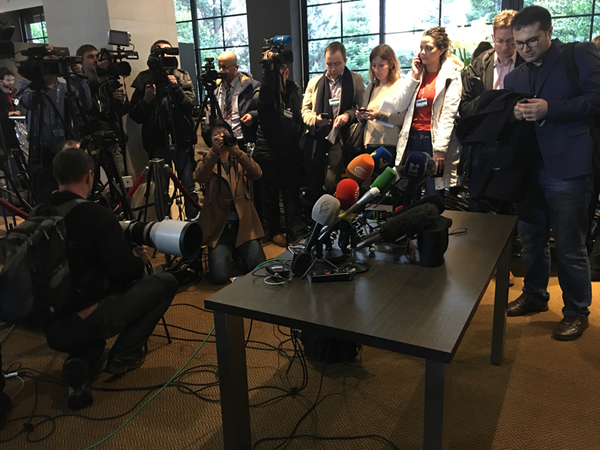 The opposition presser will start in a few minutes here at Wilson hotel in Geneva. They had just finished meeting UN envoy de Mistura at the UN headquarters. I've covered tons on Syria opposition conferences, never seen them as organised and coherent as I do now. 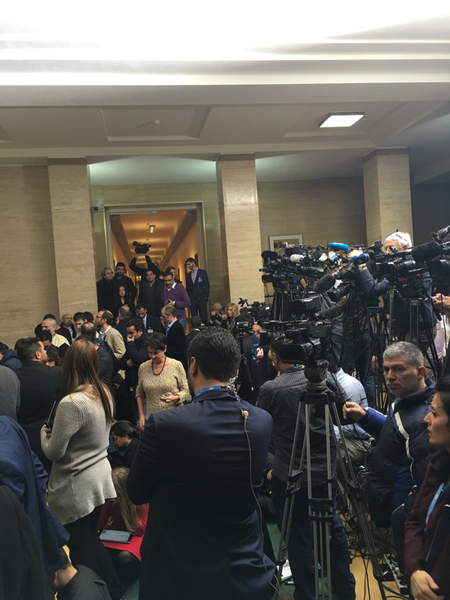 Syrian government envoy Bashar al-Jasfari's presser will start in a bit. I am there now! US Secretary of State John Kerry calls on Assad to allow the access of aid to areas suffering from starvation. Saudi Foreign minister Adel Jubair says his country supports the opposition whether they choose to negotiate with the regime or not. UN envoy Staffan de Mistura is scheduled to hold seperate talks with the government and the opposition delegations. 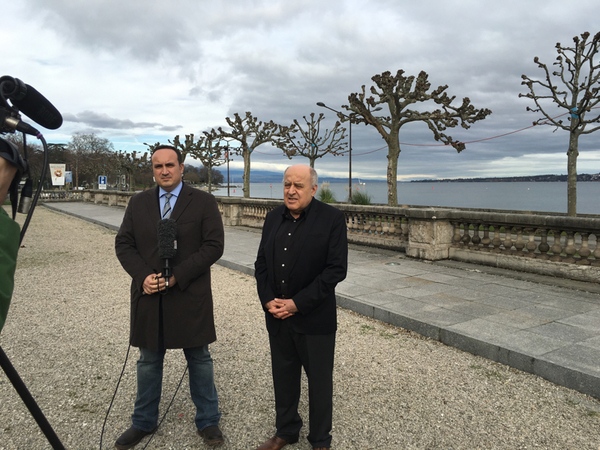 We are told the Russian deputy foreign minister is coming tomorrow (Monday) to Geneva. Both Russian Foreign Minister Sergei Lavrov and US Secretary of State John Kerry are scheduled to arrive in Geneva on Tuesday. The Syrian opposition are meeting amongst themselves to come up with a decision on whether they want to negotiate with the regime or not. We are supposed to hear back from them at around 11pm Geneva time. The opposition concluded their meeting. They will not have any press conference. 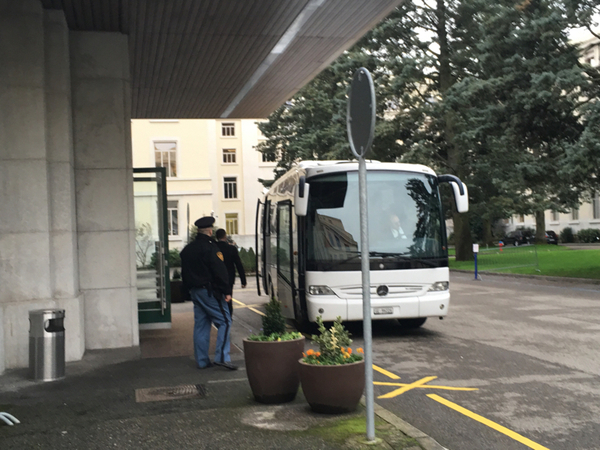 They will instead meet amongst themselves again tomorrow (Monday) at 10 am Geneva time. The delegation will meet with UN envoy Staffan de Mistura at 5pm in the UN headquarters. 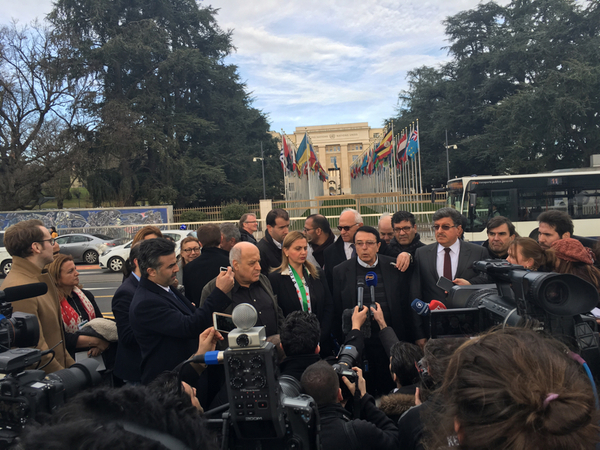 The opposition insist that going to the UN building does not mean that they have accepted to start the negotiations with the regime. The government is scheduled to meet with UN envoy Staffan de Mistura today at 10am Geneva time. The opposition this morning are continuing the discussions amongst themselves over whether they should be part of the talks or not. They are expected to meet with de Mistura at 5pm. Sources tell us that both the US assistant secretary of state and the Russian deputy foreign minister will meet this evening. Opposition members are telling me they are facing intense pressure from the US to take part in the talks. The opposition maintain they want the humanitarian demands to be met first before they can go to negotiations with the regime. "There is limit to how much concessions we can make," a member told me. Al Jazeera's Mohammed Jamjoum is interviewing opposition member Monzer Makhous on TV. "We have mixed feelings" about the talks, Makhous says. The issue of hard-to-reach and besieged locations in Syria is high on the agenda in Geneva today. 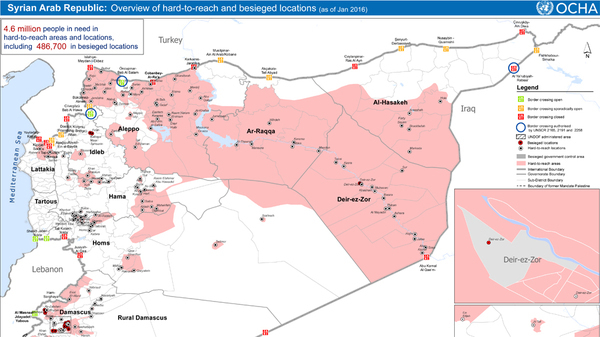 OCHA just released its latest map of the current situation. 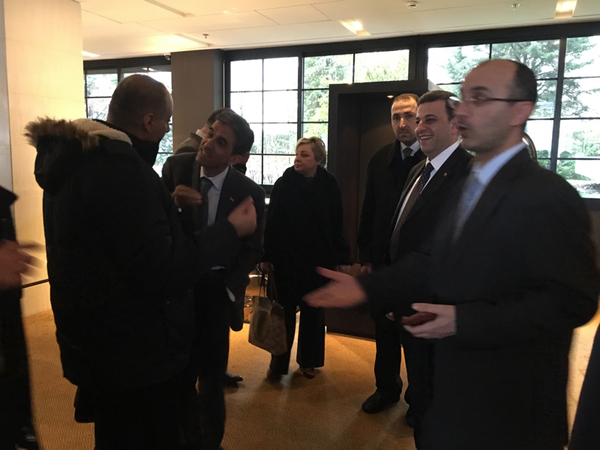 CORRECTION: The opposition bloc's chief negotiator Mohammad Aloush is still en route from Istanbul to Geneva, where his opposition delegation is scheduled to meet with UN envoy Staffan de Mistura later today. The meeting at the UN headquarters was initially scheduled to take place at 5pm Geneva time. UN envoy Staffan de Mistura is currently meeting with the opposition. He will speak at a press conference afterward. 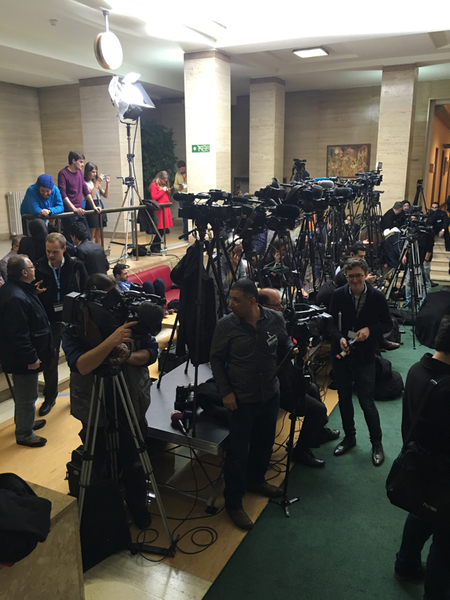 Journalists waiting for de Mistura to arrive following his meeting with the opposition delegation. UN envoy to Syria Staffan de Mistura will be speaking shortly. I will periscope his speech. De Mistura announces the beginning of the talk, today. Mohammad Alloush spoke to Al Jazeera from the airport. He said: "We came here to prove our seriousness and credibility...But Assad seems to be the one who is not serious." "We came with a message to tell people about what is happening in Syria, that the shelling is only stronger, the siege is continuing. Mohammad Alloush spoke to Al Jazeera from the airport. "We came here to prove our seriousness and credibility," he said. "But Assad seems to be the one who is not serious." "We came with a message to tell people about what is happening in Syria, that the shelling is only stronger, the siege is continuing." The opposition delegations are at President Wilson Hotel having a meeting amongst themselves. 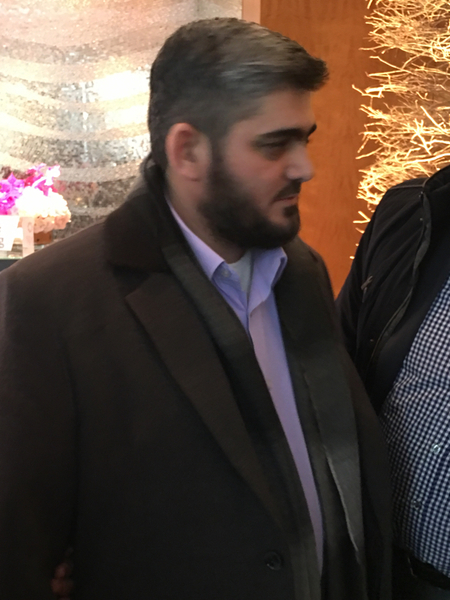 A photo I snapped of the most controversial Syrian delegation member Mohammad Alloush after a meeting last night. Syrian chief delegation Bashar al-Jaafari was just at the breakfast area in the hotel having breakfast with his delegation. This is the second time I run into him in the restaurant. The opposition will soon hold a press conference at the UN headquarters to condemn the "unprecedented" Russian bombardment on Aleppo over the past hours. An opposition source said despite that Russian shelling, the opposition will not withdraw from the negotiations. Syrian government envoy Bashar al-Jaafari is speaking live. 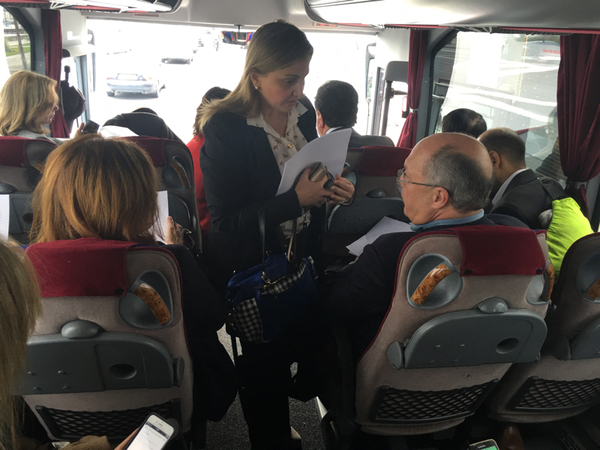 Syrian opposition members are heading to the UN headquarters to hold a pres conference in front of it. The Syrian opposition maintain that they are not going to withdraw from the talks.